Weight: 1.75 pounds (796 grams). 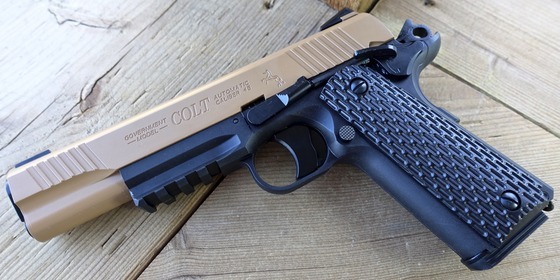 Trigger Pull: The trigger pull on the Umarex Colt M45 CQBP Blowback CO2 BB Pistol is like the original 1911 semi auto pistol a single action only trigger. That said the Colt M45 CQBP SAO trigger is notably longer than a true 1911 trigger would be but still pretty decent overall. There is a fair bit of take up but once you get to the release point the trigger weight is about a medium pull and should allow for pretty fast action shooting with not too much finger fatigue. Build Quality: I am very impressed with the build quality for the Umarex Colt M45 CQBP Blowback CO2 BB Pistol. In many ways it may even be better than the KWC 1911's as it seems to have a much more durable finish and the mechanical parts fit together very snug with virtually no slide wiggle at all. This little rather inexpensive 1911 blowback BB pistol should last you a long time and perform well doing it. Realism: Up to now I have been almost preferring the Umarex Colt M45 CQBP Blowback CO2 BB Pistol over the KWC Blowback 1911 series but when it comes to realism the tables turn a little bit in favor of the KWC 1911 version. On first look it is hard to tell them both apart so yes they both look and feel very much like real steel 1911 pistols. Once you get into some more of the mechanical aspects the Umarex Colt M45 CQBP Blowback CO2 BB Pistol does make some compromises choosing to take away a little bit of the realism in favor of increasing performance. These area are the range of motion of the blowback action. On the Umarex Colt M45 CQBP Blowback CO2 BB Pistol the slide range is a bit shorter which will save on CO2 usage and the magazine is a stick mag setup which again allows for a more enclosed system again taking advantage of all the CO2 being used. Most of the mechanical parts work as you would expect them to on a real 1911 with the exception of the grip safety. The barrel is even nicely recessed ti make the barrel opening look like a real 45 auto. Lastly the trigger even though it is a true SAO trigger does extend out from the gun a lot more than a true 1911 trigger would. Build quality and finish seem really good, excellent tolerances. Nice snappy blowback action with a pretty heavy recoil spring. Overall Accurate 1911 tactical styled replica in most ways. Does have a single action only trigger, but is longer than most. Like the white dot sights, machined hammer, ambidextrous safety and accessory rail. Cool that the Alan key is built into the handle. Has a believable recessed barrel. Finished coating seems to be more durable than the actual KWC versions. Warning instructions are color matched and not so intrusive. Trigger action is notably longer than a real 1911 trigger but is single action only. Does not have a full size drop out metal magazine but rather a metal stick mag. I can never seem to get enough of the Blowback 1911 BB pistols when I have the opportunity to review them. Most of them have been just different reskinned, rebranded and redistributed version of the original KWC 1911 so it was kind of nice to get the Umarex Colt M45 CQBP Blowback CO2 BB Pistol since it offers that 1911 look with blowback action and from the looks of things it should have improved performance in the shooting department. 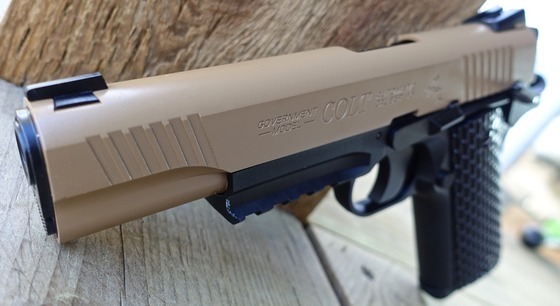 If you have been after a Blowback 1911 BB pistol but wanted one with some more power and that you can get a decent amount of shots out of a single CO2 then the Umarex Colt M45 CQBP Blowback CO2 BB Pistol may be just what you are looking for.